Easily the most intriguing person I’ve met in Phnom Penh is an American of Cambodian descent called Tom. After his parents fled the Khmer Rouge, Tom grew up in the United States. Despite his college degree, he got caught up with local gangs, which eventually landed him in prison. After being released, the US government deported Tom ‘back’ to Cambodia in 2007 – a country he didn’t have any connection with at all. Tom initially worked as a tour guide, using his combined knowledge of English and Khmer. What exactly happened in the years past is still largely unclear to me. Combined, his stories paint a picture of alcohol abuse, gambling problems, an uncanny ability to involve himself with foreigners who are in trouble with the law, imprisonment and eventually ending up on the streets of Phnom Penh. I met Tom because he lives around the corner of my old apartment, where he tries to make a living chatting up foreigners. While I still don’t fully understand why a man with his English-speaking abilities doesn’t have a job, the answer, according to Tom, is partly his legal history and partly his lack of connections – something that isn’t to be underestimated in Cambodian society. The stories Tom has shared with me provide enough material for another blog, but they include being picked up from the street by the police and thrown into a military-style ‘homeless camp’ outside of Phnom Penh, sharing a police cell with a billionaire business man from Russia and being hit in the head with a rock by his (now ex-)girlfriend. The last incident happened a few weeks ago, less than an hour before I ran into Tom. He was bleeding out of his head and seemed depressingly hopeless. Realizing neither him nor his ‘friends’ on the street would be able to pay for surgery, I did what any well-thinking person would do: I put Tom and one of his friends on the back of my scooter. Navigating the small streets of Phnom Penh’s Riverside, aided by a drunk Khmer man and his half-conscious bleeding translator behind me, I eventually managed to end up at the nearest clinic. 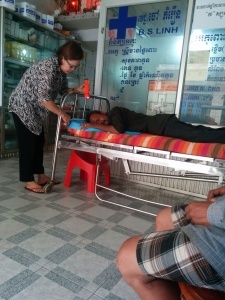 The picture on the left depicts the situation at the clinic: Tom was being operated on in the clinic’s entrance ‘hall’. Taking three steps back from where I took the picture, I would stand in the middle of the sidewalk. No doors, no privacy, no nothing. Many of the people and stories I run into are very similar: young people, often in their early twenties, who are putting in an incredible amount of work for a better future. Many of them have to fight against their background, their community’s traditions and expectations, or against the status quo that has characterized Cambodia for a long time – a status quo that is increasingly being challenged. One of these people is Sopheap, a 20-year old girl who, like most people in Phnom Penh, came here from the provinces; in her case two years ago. The oldest of four children, Sopheap does not have the luxury of parents who can support her studies. But instead of moving to Thailand is search of higher wages as many do, she chose a different path. Working in a guest house six days a week, Sopheap makes $150 per month, a relatively good wage for someone her age. With that, she pays her way through university (six evenings a week) as well as her small apartment 20 minutes outside of the city, where she lives alone. Amazingly, she even manages to partially support her brothers and sister. A similar story is that of Veasna, a 14-year old boy who is living with friends of his parents. I met him in my first week in Cambodia, when I bought a newspaper from him and proceeded to invite him for dinner. Veasna was sent to Phnom Penh by his parents to attend high school, as well as English school – something that is unavailable in his home village. While public high schools are free, Veasna is largely dependent on the English school to actually learn something. With the average public teacher in Cambodia earning insufficient income to support their families, they often resort to a practice of keeping the general classes short and uninformative, while asking ‘entrance fees’ for the private classes they offer on the side. With Veasna’s parents determined to give their son a better future, but unable to pay for it, they sent him to live with a befriended family. To pay them for his board, as well as the tuition fees of the English school, Veasna spends all his evenings outside, trying to sell newspapers. Next year, when his little brother finishes elementary school, he is likely to have a competitor on the streets. At 21, Ratana is the oldest of the children in a children’s home in Battambang province. She was taken into the home at 14, with her single mother ailing from a disease that makes it impossible for her to support her children. The children’s home, which she repays by doing administrative work and serving guests, offers Ratana a place to stay and pays her tuition for the Finance studies she is doing. To illustrate her ambition: she moved heaven and earth to get into an English course offered by one of the donors of the children’s home, for which she was officially too old. When I met her last time, we went over her answers to a test she had received a failing grade on. After I told her I had found only 5 mistakes in her 50 answers and that she should probably appeal, she answered: “It’s too late for that… But I don’t care about the grade. All I wanted to know is whether my answers were right”. Ratana’s ambitions are in stark contrast to the standards set by her native community: nearly all her friends are working in the rice fields, and most have married at this stage. On the contrary, Ratana does not believe in early marriage, is pursuing her undergrad and looking actively for scholarships that will support her Master’s degree – determined to break out of the status quo prescribed by her community. In 3.5 months, I haven’t met a group of people more determined to break that status quo than the young women who started the Lady Saving Group four years ago. Then students, the girls were unable to find a summer job, and instead decided to start a company of their own. Four years later, the Lady Saving Group has some 70 female members, who all both save some of their income with the group, and have the ability to take out a loan when they need it. The founding group is still together and manages the fund voluntary, next to their jobs. Their ambition is to found the first commercial bank focusing on the development of women entrepreneurs – a point of attention sorely needed in a country that has one of the worst gender gaps in the world. It is groups of young people like those who founded the Lady Saving Group that made me come to Cambodia. More than an absolute level of development or comfort, what I find most important in the environment I live and work in is a willingness to work for a better future. With a group of ladies so strongly determined to making life better for the women they support, I can only be grateful to offer them some help in achieving their objectives. Let’s hope their masses will swell in years to come. *All names in this blog are fictitious.